One morning, from my desk in Kigali, Rwanda, I set off on a road trip across America – with Google Street View. I started at the easternmost point on the US mainland – West Quoddy Head, Maine – and clicked westward once, and then again and again. Petabytes of Google imagery later, I found myself halfway across the country with a journal full of small-town historical anecdotes and screenshots of the open road. It is the Great American Road Trip, done virtually. My expedition was inspired by mild homesickness. For most of the past decade, I have lived in sub-Saharan Africa, an American lawyer tending to microfinance and legal aid projects in humid Ghanaian cities and lush Sierra Leonean villages. The Internet, for all the tethering benefits of email and Skype, proved a dissatisfying portal home. I’d been streaming America in the uncompromising volumes and divisive tones of 24-hour news cycles and now-now-now social media. I needed doses of the America I hoped still existed, of less angst, more commonality. What, I wondered, would I find in America if I used our digital tools. . . slowly? My road trip strictures were firm: I could not leave the Street View interface to fly over featureless farmland. I could not close my browser in Philadelphia and re-open it in the Pittsburgh suburbs. One thing I found in abundance: self-storage facilities. On a trip that tallies some 3,700 miles and hundreds of thousands of mouse clicks, certainly no other structure type — rows and rows of gray units with bright, metal roll-up doors — repeats more often on my laptop. In Street View America, these banks of self-storage stretch roadside everywhere, from downtowns to rural tracts, even where property acreage and barn capacity should obviate need. Self-storage facilities in Manteno, Ill. 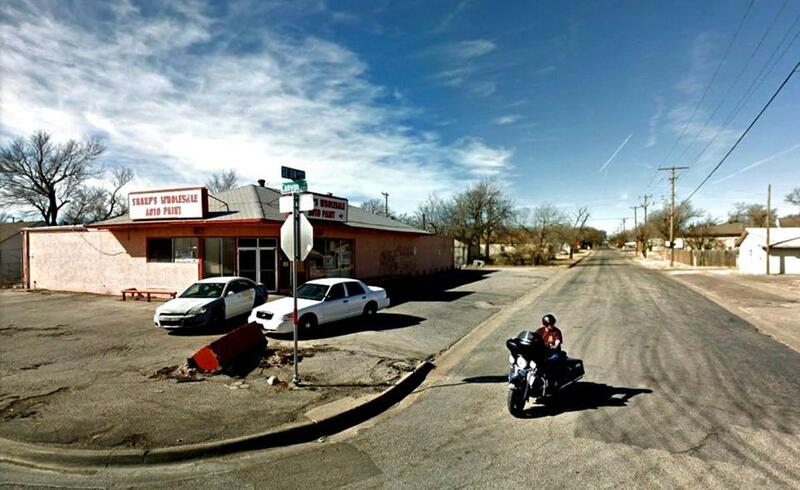 Such banalities — as well as boredom — might seem unavoidable on a long-distance Street View session like mine. This is no VR spin around Times Square or armchair stroll down one’s own street. Like most travelers, though, I have a travel guide on hand. It’s called Wikipedia, and I browse through as I traverse and scan the digitized landscape. At every odd river crossing, town green statue, or incongruous Victorian, I pull up an entry, and Wikipedia — as encyclopedic of American history as Street View is of American terrain — reliably provides backstories of local heroes, villains, and heydays. Even the smallest towns in the most middle America often betray something larger. Swedish flags in Bishop Hill, Illinois, (pop. 128) tipped me off to a significant early Scandinavian immigrant colony — and the tale of its founder’s murder over love and family feud. Jerkwater Road in rural Indiana led me to a lesson about boilermen aboard olden-day steam locomotives who jerked spigot chains at unmanned water stations (in middle-of-nowhere jerkwaters) to fill their boilers. Trivia this may be, but trivia unceasingly aggregated has formed one of the most reassuring revelations of my cross-country trip: America is deeper than Twitter and Facebook feeds would suggest; America is, yes, great. Still, it is impossible to miss something else in Street View America: vacant and derelict buildings are endemic; inequality runs visibly rampant. From rural Maine to the Rust Belt’s heartland and west, I cannot click but minutes without encountering an abandoned home or gutted Main Street. An hour in West Virginia and central Ohio downloads enough barren steel industry apparatus and one-bar, one-post-office town centers that the disconnect from wealth — and Washington — is palpable. Coastal, global, and utterly educated, I frequently encounter an America I do not know well — the America that has sent people like me to read “Hillbilly Elegy,” “White Trash,” and “Strangers in Their Own Land” in search of understanding. Street View travel is my awakening. It is one thing to read narratives and case studies of our national fracture. It is another to actually see it, face-to-screen, by scrolling slowly through one disenfranchised town after another in a sequence so sure that the breadth and depth of the Trump-American landscape feels as infinite as Google itself. Street View as societal mirror already underlies many artists’ work. Jon Rafman and Doug Rickard both produce striking fine art from compelling moments frozen in Street View, with Rickard’s images of solitary figures in bleak urban lots and alleys commenting especially on the economic deterioration and disempowerment that I have found so obvious. I would never argue Street View travel is “just like being there” or as eye-opening as engaging real humans of opposite political and geo-economic circumstance. But I have never read or streamed anything online that did a better job of showing me America with nuance and perspective. Where today’s Internet traffics in “fake news,” ghettos of unchallenged viewpoints, and megaphones for ISIS and white supremacists alike, Street View is refreshing. I cannot click but minutes without encountering an abandoned home or gutted Main Street. In Rwanda, I often logged off virtual travel sessions with reluctance. My respite was over. Was it from homesickness, or something else? Matthew Muspratt, a writer, has worked in banking, legal aid, and entrepreneurship development across Africa. He blogs about his virtual road trip at mmuspratt.com/across-the-usa.